When you think about trash receptacles, you think about the utilitarian nature and functional aspect first. And it’s true: trash cans serve a purpose. They do a job. But they can do much more than work. After all, receptacles are located in public areas seen by everyone passing by daily. In fact, receptacles can impact your guest’s first impressions of your property. Trash cans actually have the power to transform a bland, monotone location into an engaging, colorful one with design accents and “notes” that elevate the experience of building tenants and visitors. Glaro Inc. has designed extensive product lines around this very concept. Find a finish that looks great in your building or office suite and fits well into the space’s color palette. Many people do not know that Glaro Inc., a leading manufacturer, will provide a choice of smooth, textured, and gloss finishes, as well as satin aluminum and tarnish-proof satin brass. Glaro Inc.is well known for its versatile finishing options that include 29 smooth or textured baked powder coated colors and two “metal’ finishes. 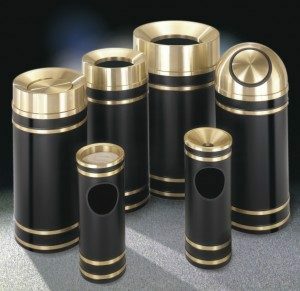 Receptacles may have matching covers and bodies as in “all satin Aluminum” or coordinated finishes such as with a striking brass cover with a green body. In sum, they provide the variety of finishes as well as the option of customizing the product. At Glaro Inc., any powder coat finish can be supplied for the bodies with one of three types of covers finishes: matching covers, satin aluminum covers, or tarnish-proof satin brass covers. To enhance receptacles further, Glaro Inc. offers the Monte Carlo, banded design. Three individual metal bands in your choice of satin brass, satin aluminum, or a finish to match the bodies are wrapped around the body of the receptacles in specially formed decorative channels. The final “look”: a stunning, sophisticated, high-end, elegant, and distinct appearance. Accent bands are a great way to make an impression by doing something different and unique in your lobby or anywhere in your building. Waste receptacle manufacturers such as Glaro have receptacles that are ideal for indoor and outdoor use. If you would like to match your outdoor receptacles to your indoor receptacles select the models with a canopy top. Canopy top receptacles keep rain water from entering the inner container during adverse weather conditions. These units provide the range of designs needed to maintain a design theme outdoors as well as indoors while maximizing function. Visitors and employees will experience a seamless design transition wherever they are. If you are in need of receptacles for Hotels, Casinos, Restaurants, Cruise Ships, Institutions, Government Buildings, Building Lobbies, Museums, Airports, Rest Stops, The Hospitality Industry, or any public place, we encourage you to contact us. The products your order will be shipped in a few days. The Glaro team is happy to speak with you or answer any questions you may have. Call 1-888-234-1050.